Last weekend I went for a long delayed & awaited trip to Penang! I set off to a trip that's worthy of writing about... full of drama & twists! We did lots of manly stuff!! honestly, I arrived in Butterworth on the afternoon of Friday like a newborn baby, excited & absorbing into my soul every single detail of this new found land. My man friend & his brother showed me all of Butterworth plus some surrounding provinces. 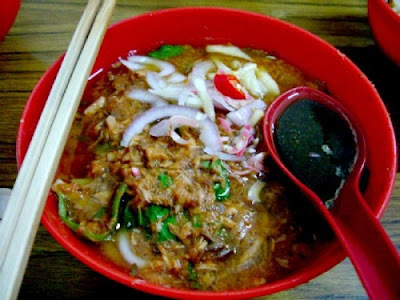 I was taken to places with good Penang food, taken to the beach, the local mall & given a glimpse of the life that they live in Butterworth as young men. We watched, the movie, 10,000 BC & it was quite a good movie! Definately worth paying to watch in a cinema! It's a meaningful movie that you can bring your girlfriend to & also a manly movie the macho man can watch with his league of extra-macho gentlemen. One interesting thing I found out on this day was that not many of the Chinese in Butterworth & even Penang Island can speak Mandarin! Not many of the Chinese in Penang are educated so they only know their mother tongue, the creole, MinNan or HokKien. Only the well educated Chinese speak Mandarin! I was amazed to find the all so common Mandrin a prestiege langauge in Penang! Wow! I was treated like an genius or star student by the people I spoke Mandrin to in Penang... So I tried to speak HokKien whenever I could to build solidarity with the locals. 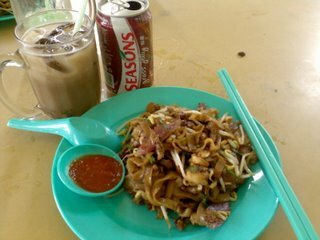 The Char Kueh Tiaw was exquisite! When they ask if you want the Chinese waxed sausages, ignore all the health warnings your parents drilled into you! Widen your eyes & say yes because it completes the fusion of flavours that will pleasurably dance around your taste buds as you chew! 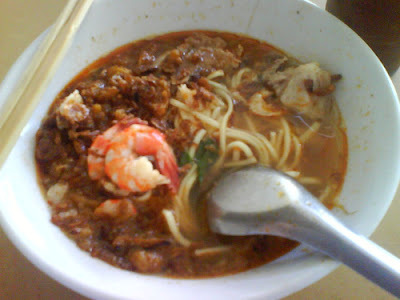 The Penang Mee was somewhat light when compared to its cousins sold in KL. I prefer the KL version but i do give some credit to the Penang version because the intensity of the flavours were just right for me to taste the individual ingredients and enjoy the dish without rushing for a drink to quench my MSG induced thirst! 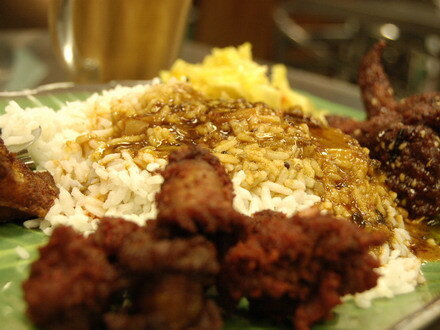 Of course, the most successful (as well as most expencive) Mamak (or Nasi Kandar) Restaurants, like Pelita, came from Penang. So here I am. Let me at em'. Hmm... Looks the same... Tastes the same... Costs... Less! It got me smiling there! Like any good romance movie, the hero has to successfully complete several obstacles or quests before meeting the heroine. As for me, I had to sail from the mainland to the island by stowing away on an overcrowded slave transport ship they call a "ferry". At Queensbay mall, the hero took his sweet time browsing through the stores in the mall while waiting for his heroine to turn up... (why are they always late?) The new mall looks marvellous & squeaky shiny clean! The best part is that the air-conditioning was refreshingly cold! A very welcome treat for someone who has spent lots of time outside in the hot equatorial sun but a shivering nightmare for the female who dresses less during the summer-like days. When the heroine finally arrives in her fine carriage driven by her kind mother, the hero has his very first glimpse of her... from a distance. He catches sight of the long flowing dark hair and the beautiful slender legs of the heroine... "Wow... She doesn't look her age..." he thinks to himself as he nervously but confidently walks his way towards her. He smiles to himself as he feels very blessed to have someone like that agree to spend her day with him; taking him on a personal tour of her exotic island! First issue of the day was transport. The hero & heroine needed a means of transport. A vehicle of some sort to help them get around the island. Due to the day being polling day for the elections, the car rental companies visited by the trio have closed for the day. So they headed over to the airport in hopes that the booths there were still open. After a careful survey, the hero hired a Proton Persona from Kasina rent-a-car. He was very sweet & appreciative even after i have returned the car! An excellent example of perfect customer service in Malaysia! I believe his name was Karan. Another Indian dude i will have fond memories of.. Here's a pat on the back for you, Karan! The Proton Persona drives and steers well. However, the buttons on the steering wheel that controls the radio does malfunction & the acceleration of this car with automatic transmission left little to desire. I love the handling of the vehicle & the overall feel of the car. With the right paint & tints, it can be somewhat goodlooking too! On my boat, we had many good moments talking about everything and anything... sometimes even rubbish! In any good movie, the hero will sometimes be helpless & it will be up to the heroine to unexpectedly become a hero. And she was surprisingly apt in that role... She skillfully guided him all around Penang. She showed him her school, places with good food & famous landmarks of Penang Island. actually the heroine happily braved the rain to take me to a market with good Penang laksa served by an adorable grandma! The Penang laksa was actually very very good! It's rich & thick with fishy goodness! After a whole day of exploring, we headed over to her place & had a good shower as well as a fresh change of clothes. From that moment onwards, having her out with me became absolutely electric & extremely gratifying! I felt like Rupee in his song "Tempted To Touch"! Most of the night was spent relaxing in the lounge at Segafredo cafe. Just me and my heroine. It was there at the cafe that we really got to know each other. We took off our masks & we let our guard down over some well made Segafredo coffee. She blew me away with her thoughts & her experiences. They taught me something about life. It somehow proves that an old man can learn from a younger person. 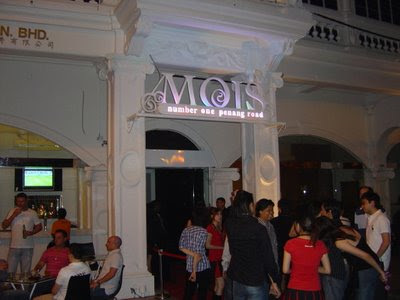 Later, we finished the night off by visiting at a new dance club, MOIS. The league of extra-macho gentlemen from Butterworth met up with me & my heroine before the whole group headed to MOIS. We got a bottle of Otard VSOP, a favourite of mine, & had the cover charge for the 5 of us waived. My parents wanted me to fly back to Kuching on the next available flight. They even wanted me to sleep in the airport until there was a flight available. It was 3AM in the morning. They have been calling every half an hour since 11PM. They were very worried because BN had lost Penang in the elections. They were worried riots might break out. Out of respect to my parents, I had to comply. But dont you hold your breath!